Recently I was in Folly Beach, South Carolina, for a family vacation. When trip-planning was underway earlier this year, I contacted my friend, quilter, and (ahem) quilt book author Kelly of Stitchy Quilt Stuff about connecting while I was in her neck of the woods. 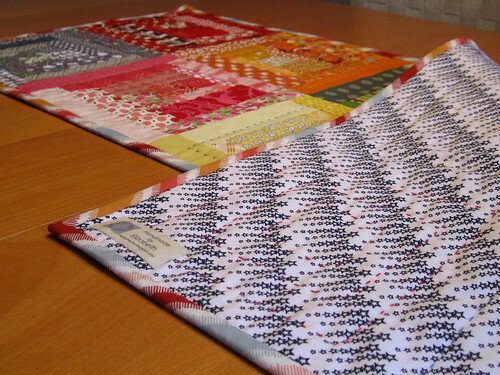 I suggested we do a little swap, and we landed on either a place mat or a table runner, plus a bag of fabric scraps. I've known Kelly for a long time and followed her quilting adventures for a while, so I've picked up on her fondness for rainbows and colors in rainbow order. Over the course of the last year or so, I've been making these one-color log cabin blocks as a way to use up scraps and make something fast and low-stress. I don't have a firm plan for them and I have no idea when the project will end, so I decided to use some of them in a rainbow-ish table runner for Kelly. I made up the dark blue and neutral blocks for this project, but all the others were just sitting in a drawer, ready to go. For the back, I used Dear Stella Shooting Stars in white and navy; it's been in my fabric stash for a while, but I've never been able to find the right project for it. I like that it gives the reverse of the table runner a very different look, if Kelly ever wants a little less punch on her table. I tried to do some straight line machine quilting, but my basting wasn't great and the seams were pulling too much with the lines of stitching, so I ripped it out and opted for hand quilting big stitches with perle cotton. I used a different color in each block. The bias binding was left over from this chenille baby blanket. Enough about my table runner. Want to see the one I received in return??? I love it! 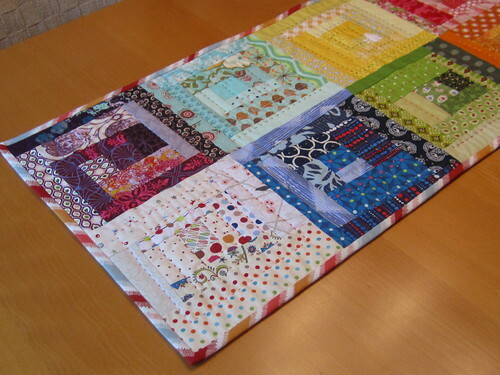 Kelly used the Happy Go Lucky fabric collection and an interesting layout of half-square triangles. The back is Michael Miller's Put a Lid on It -- perfect. Check out Kelly's post on her work here. I'm so glad we arranged this swap. I love my table runner, which looks fantastic in my newly painted grey dining room. Kelly really got my style, and I hope I got hers! Welcome! We're sisters Jen & Elizabeth, and when we're not working our day jobs, we find our creative outlet blogging about the nifty things we encounter and make. © 2010–2019 by Jen and Elizabeth. You're welcome to link to this site or use a single image and brief description to link back to any post. Republishing posts in their entirety is prohibited without permission. 2011-2013 Inspire Me Grey. Simple theme. Powered by Blogger.